Nintendo games seem to be a particularly popular option for counterfeit product makers; the chances of finding a whole host of knock-off goods from any car boot sale or eBay search is scarily high. 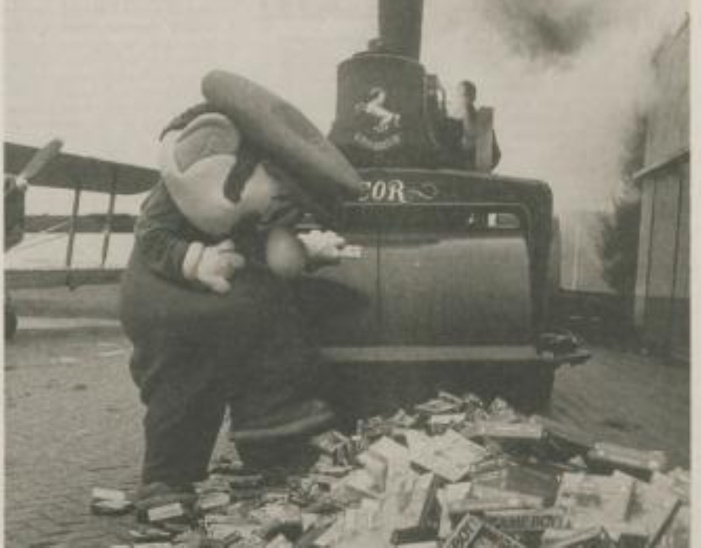 While we don't always see how companies such as the 'Big N' deal with such matters, these recently rediscovered photos show what is possibly the best method we could ever imagine. Enter the steamroller. 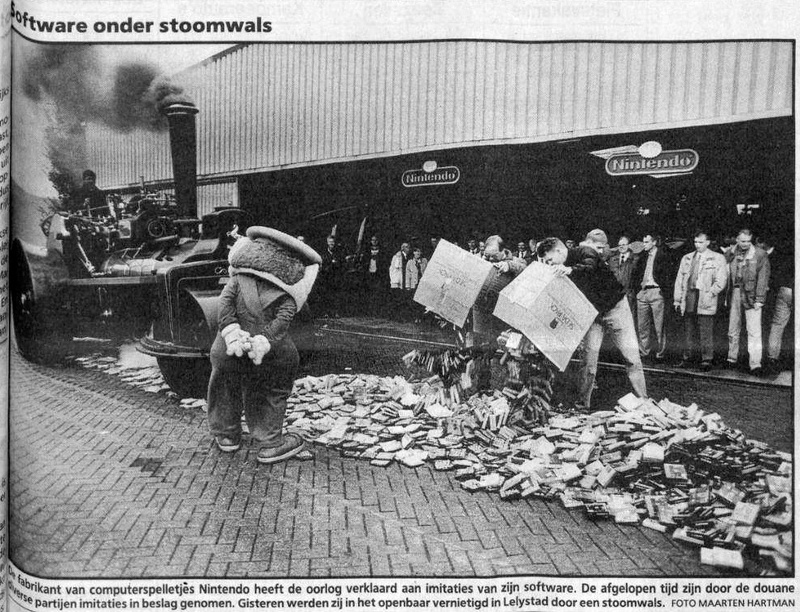 Found by the archivists at Gamegeschiedenis, these images of counterfeit Nintendo products being crushed were reportedly taken in the Netherlands back in 1994. 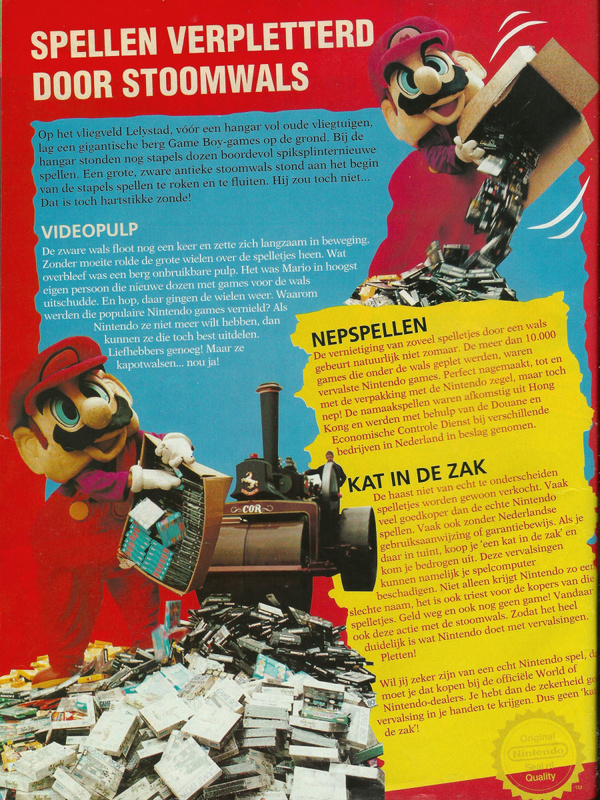 The photos featuring some lucky employee whose job was to go around stomping on the fake games in a Mario outfit stood out as a particular highlight to us, although that actually does seem like a good way to put across a strong message to potential fraudsters. Video game company Nintendo is using a roller to combat piracy. 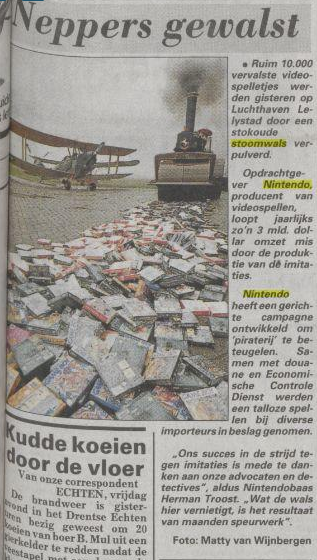 At Lelystad airport ten thousand counterfeit video games were crushed. The Japanese company has started a targeted and structured worldwide campagn to combat forgeries of their video games. 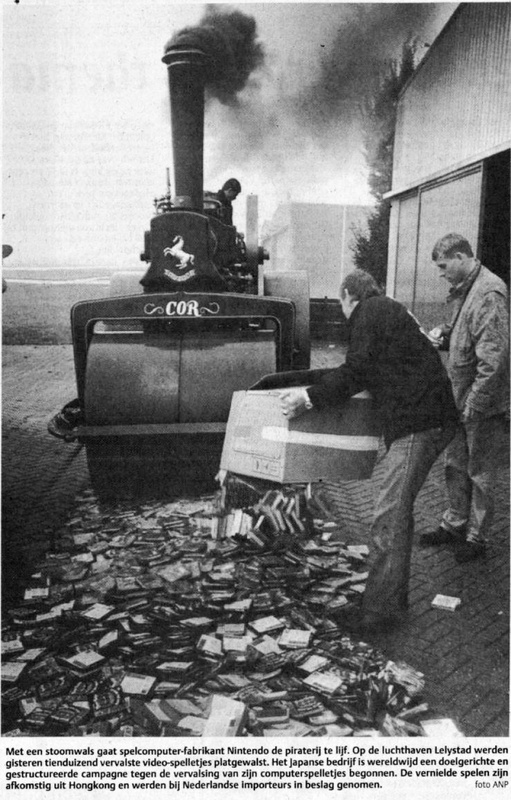 The destroyed games came from Hong Kong and were confiscated from a Dutch importing company. If that's not an effective way of getting rid of counterfeit goods then we don't know what is. We bet you weren't expecting to see photos like this to kick-start your weekend! That first image looks like it was from the story the other day about their original headquarters. Edit: You could also say it's not a great advert for recycling. At an airport, one of the leading industries responsible for much pollution in the world, literally using a steam roller, billowing out smoke. And where did all that carnage end up after the publicity stunt? Probably buried in landfill next to all those unsold Atari E.T games. Cool to see these Dutch articles. I feel like I've seen that first photo sometime before. 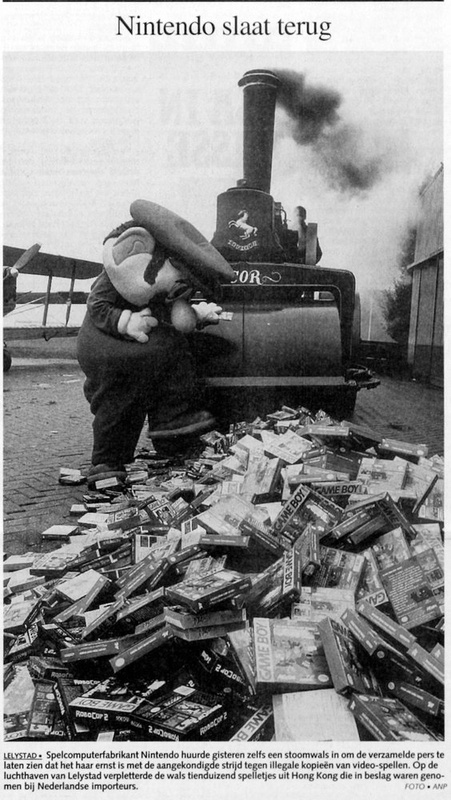 Never mind counterfeit games, what was done about that counterfeit Mario?! Great pics! Wish Big N was still on a rampage. All those fake eBay games are likely plummeting the value of our retro collections. Back then the bigger stores only sold the real games, some smaller ones or people selling games on conventions had sometimes fakers, searching for fake games was easy but for a regular person not really something common, most people bought them by accident or because they didn't know that "a real super mario world" can't be 4 times cheaper new just after 4 months. Fake games are nowdays a bigger issue because the retro games aren't just for regular sale because of their age. @Fuz lol He does look pretty derpy. Holy recycling policy Mario! You don't want 'em? give them to me! if the game plays and runs like it's supposed to I couldn't give a toss if it's coated in official Nintendo shrinkwrap or wrapped in wet lettuce. Mario looks a coked-up freak on a head stomping rampage! "Mama Mia! You will not take any more the board of director's coins - they need a gold plated barnacle scraper for thier yatchs!!!" @Rayquaza2510 Fake GBA games are rife on eBay UK as well, I even saw a stall at MCM London years ago selling reams and reams of them. If you watch closely you can see Cemu in the middle of the stuff too. and why did they use an actual steamroller? surely they had better equipment in 1994. We are so lucky to have the iPhone, back in the 90's they didn't even have colour camera. I like how the steam roller isn't enough and Mario is there curb stomping them too. Lol! Za Warudo! Road roller! Wryyyyyyyyyyyyyyyyyyy! Fake games are Real Nightmare in my country Indonesia. If you visit one of "Black Market" video games shop in my place Surabaya (and other places) you will feel cringed. Hmmm, here's a thought.. a nintendolife booth at MCM comicon? That employee didn't feel lucky. Ugh, so many wasted circuit boards, screws, and plastic moulds. This hurts me more than others because my work involves electronics recycling. They probably did toss out the remains and allowed the powderized chemicals to drift into the air or leach into whatever dump site they chose after rain. I don't think they would actually do this today, the EU's recycling policies have evolved quite a bit over the past 24 years. This would be especially illegal in Germany today. On a side note... This is the TRUE Mario. That happy go lucky Mario in all the games and media? That's just a stage act, which SMB3 alluded to. Mario is actually a homicidal psychopath with a penchant for destruction. (Proven by SMB1 manual.) So now we see his sunken, horrifically evil face. It's even worse than I imagined. It's high time for a Koopa Revolution! @Nincompoop those were newspaper articles, those were black & white in the past to save cost. @Rayquaza2510 did you know Marktplaats is wholly owned by eBay? It's an eBay subsidiary. I didn't know mobile phones existed in 1904. I'm surprised they haven't commemorated this yet in a Mario game as a steamroller power-up. Mario isn't standing in a very sensible place in that photo. Is that why his hat is so flat? Geez that is a terrible looking mario head...glad they fixed that. You can destroy counterfeits all you want, that won't stop the Chinese from continue making them and earning profits. In other news, that's got to be the ugliest looking Mario I've ever seen. 1984 by George Orwell, nintendo destroying reminded me of it. but I guess this is more Iike fahrenheit 451. That was Wario in a costume. Could only make out Robocop 2 for GB. I remember back in Gibraltar seeing Pokemon Jade and the "Original" Diamond for GB. Plus a more recent one with kind of a less stylised Ho-oh. Shinygold version I think. @AlexOlney Did the guy have tonnes of Mega Man Batle Network 6 and Fire Emblem copies? Cos I remember seeing that one. Why didn’t they use MARIO, he squashes everything he jumps on. I once bought a fake copy of Pokémon Emerald of Marktplaats, which quite obviously had a defect safe battery, or no battery in it at all. I contacted the seller and he was kind enough to refund me. I think that was a rare exception though. Most people willingly sell fake games and therefore, the buyer is pretty much screwed in most cases. Nowadays I don't even want to risk buying GBA cartridges/DS carts from sites like Ebay, unless the games are complete with box, to avoid getting scammed. It's quite sad really. This post inflicted Kyriaki on me (not literally). How do I play Mother 3 in English without resorting to piracy? oh lord is that europe mario? no wonder those guys don't buy much nintendo stuff. that guy is a mustache twirl away from tying princess peach up and putting her on train tracks. Lol, I remember it from Nintendo Extra. Iconic images! @Rayquaza2510 @Gex91 luckily here in the netherlands we have a lot of used game stores, also every big or monthly flea market has a trust worthy used game vendor. Might be a bit more expensive (depending on the game and store) but atleast we have these options. I just went to a new store (game solution ijmuiden) and bought some used games. It confused me a bit Seeing all these articles lately that dedicated game stores and used game stores disapear even though here we get more and more of them. What do you even say to this? I hope they at least recycled them afterwards. Tsk tsk. 1994? I have seen better photos from the 1960s! Are these real? Article is from 1994 and yet it looks like it could have been from the WWII era. I'm guessing we missing context on this event. Ww2 era airport, ww1 era. Steam roller. Ww1 era airplane. And ww1 era quality photos. And evil Mario that looks bootleg all on his own. Maybe there's a steam joke to be had in here. Tell me Mario, how many mushrooms have you eaten in your life? I do. Not every newspaper at the time printed in full colour. Nintendo of Europe doesn't mess around.